For the first time in the history of the prestigious Westminster Kennel Club Dog Show, the winning pooch has the face of a monkey. For the first time in the history of the Westminster Show, an Affinpinscher took the Best in Show prize. 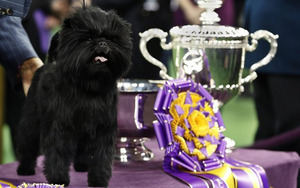 Banana Joe V Tani Kazari, affectionately known as Banana Joe (or just Joey to his close personal friends), became the first ever Affenpinscher to claim the “Best in Show” ribbon at the 137th Westminster Kennel Club Dog Show. DogTime.com put Banana Joe on its shortlist of “Best in Show” favorites to win, and sure enough Tuesday night the champion Affenpinscher pulled out all the stops to emerge top dog. The tiny toy breed known best for its monkey-like face and bouncy gait has been a part of the celebrated WKC competition since 1938, but had never claimed the title of “Best in Show” — that is, until 5-year-old Joey came along. Joey’s proud handler, Ernesto Lara, couldn’t be happier with his buddy’s 86th overall show title — arguably the hugest victory of Joey’s career. Judge Michael Dougherty had the difficult task of picking the winner out of a crop of seven deserving candidates. Banana Joe had some tough competition going into the “Best in Show” round, including Portuguese Water Dog, Matisse, who in an upset victory beat out champion Doberman Pinscher, Veni Vidi Vici; American Foxhound, Jewel; Honor, a Bichon Frisé; Adam, a Smooth Fox Terrier; German Wirehaired Pointer, Oakley; and the Reserve Best in Show winner, Old English Sheepdog, Swagger, who’s exciting journey to the final round of the 137th Westminster Kennel Club Dog Show was only the fourth competition he has ever entered. But co-owner and breeder Mieke Cooijmans is quick to point out that Joey is more than just a pretty face. “He speaks German, Dutch, Spanish, and English,” Cooijmans tells the Washington Post. So what’s up next for Banana Joe? Retirement, says Lara. As the reigning WKC “Best in Show” the little guy will make a victory lap of appearances before heading back to his home in the Netherlands. Joey plans to spend his retirement playing with his favorite squeaky mouse toy.